As I gathered the photos for this blog post, I realised that there is less then a week of trip travels left to blog about! This combined with the fact that Karen Camper was driven away by somebody else last week, (she sold only 2 days after we listed her on Gumtree!) means I am feeling a little sad that our trip really is coming to a very ‘official’ end. 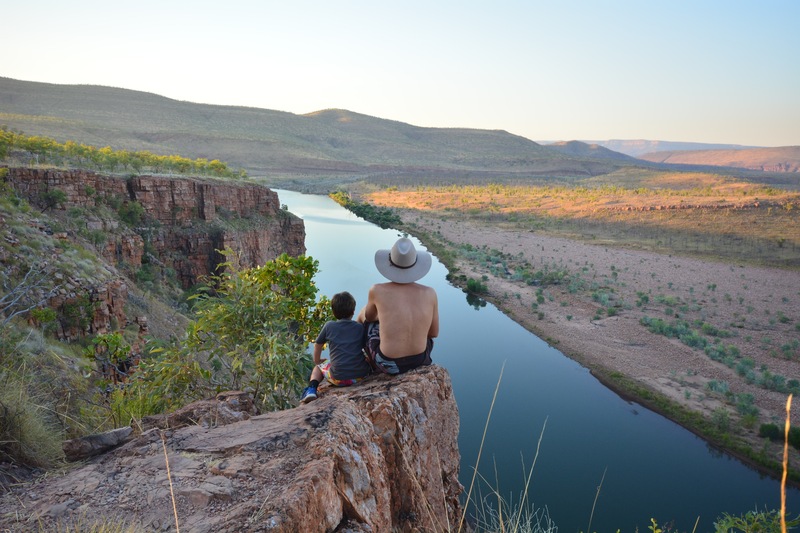 I am reminding myself though, that as my mum-in-law Gayel said to me last week, “if you hold on to one adventure too long, you will never have another”, and she is exactly right. 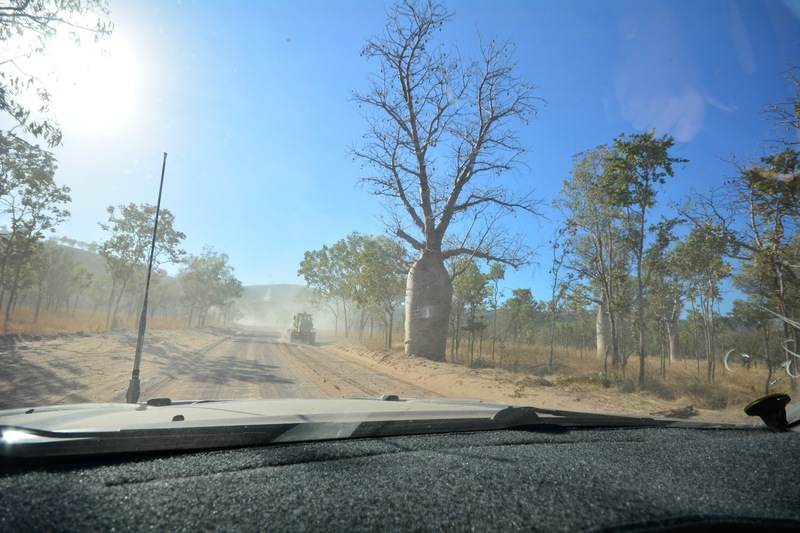 Following the grader out of El Questro Station – very dusty! 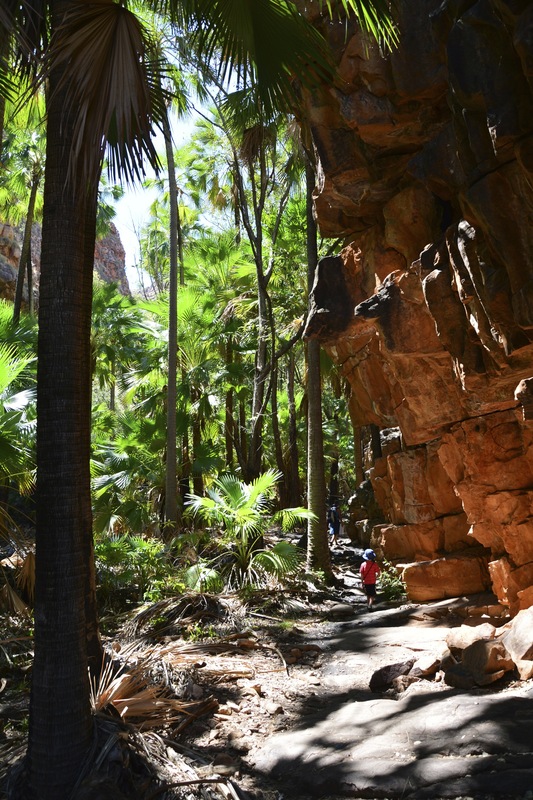 we headed about half an hour down the road to Emma Gorge, which is also still a part of the El Questro Wilderness Park. 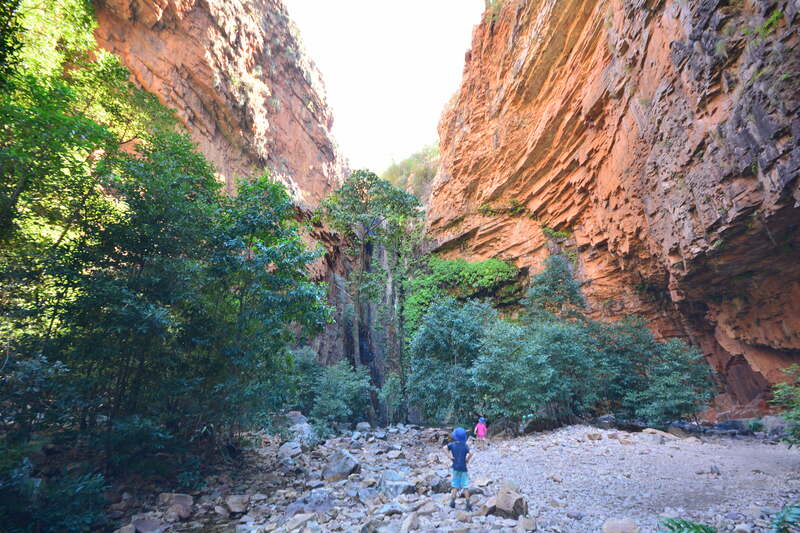 There is no camping at Emma Gorge, but there is a lovely resort with tented cabins, a restaurant and big swimming pool. 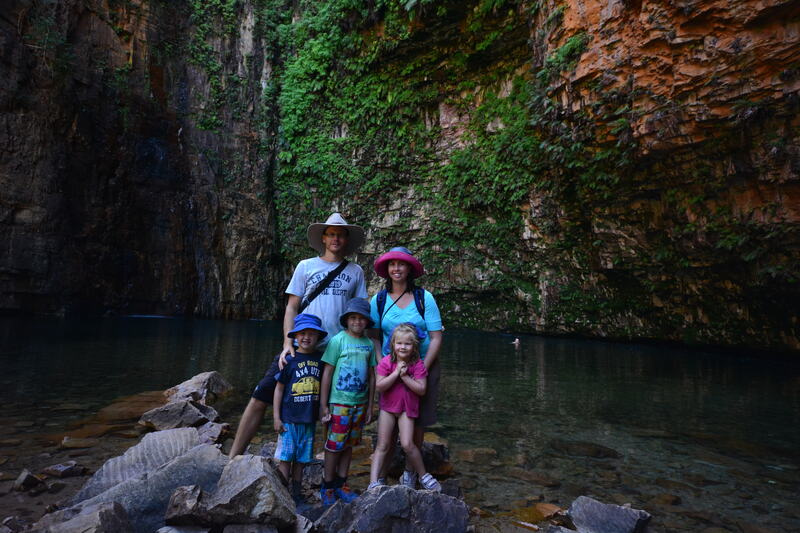 We arrived there at about 8am and quickly headed off to walk in to the Gorge to try and beat the heat. It was a pretty tough walk in and seemed to take us forever, but it was probably only a bit over an hour in. The kids did really well again, managing the rocky path and the boulder hopping/scrambling that is required just before you get to the waterfall at the end of the gorge. 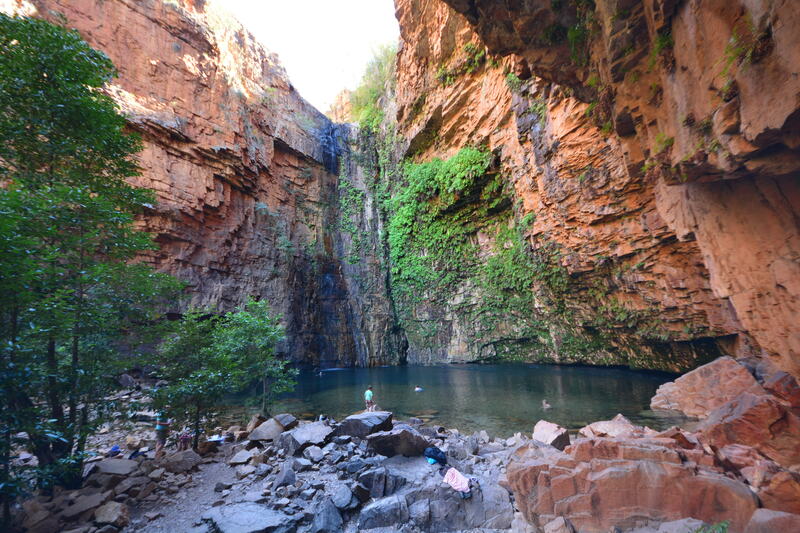 The beautiful swimming hole and waterfall at the end was worth the walk in! 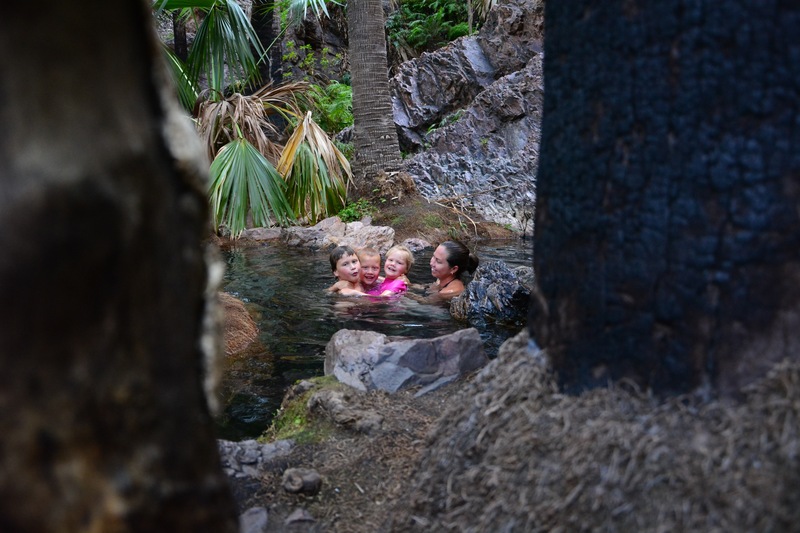 We all were hot and sweaty so stripped right off, jumped in and got the biggest shock – the water was FREEZING cold!! We had been given the hot tip however, to head over to the rocks on the right where a lovely warm spring was so we all huddled in there. We were even lucky enough to have the place to ourselves for a little while! We made it! Not a lot of water coming over the falls but still really pretty! 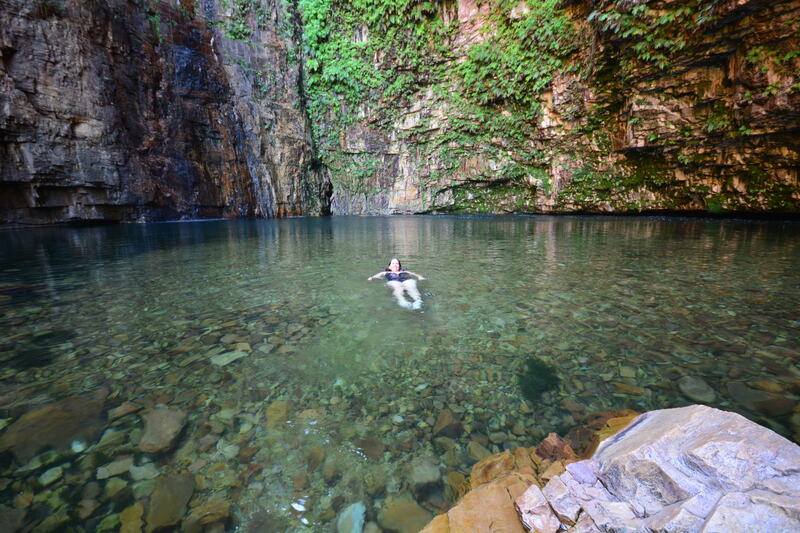 Me having a swim – I had to force myself because it was very cold! 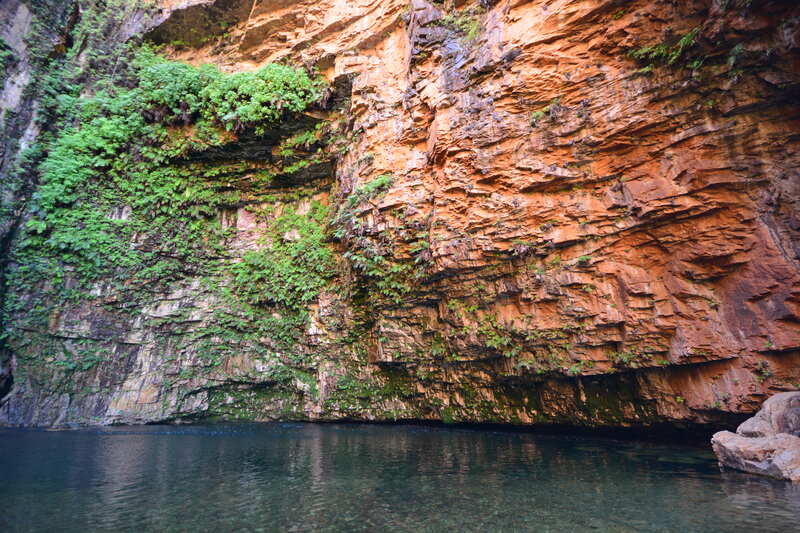 It was very rocky (sharp rocks) at the waterhole – we would have been better to wear our reef shoes for the walk in. 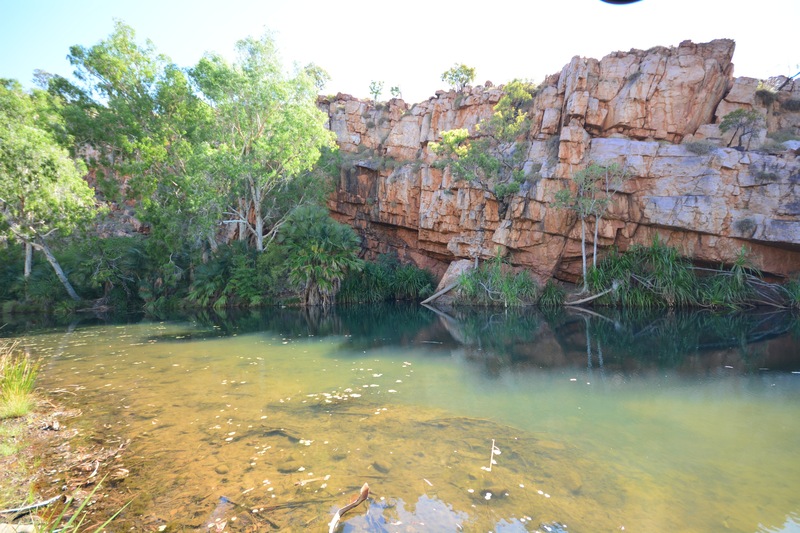 This was our final stop along the Gibb River Road and definitely one we wouldn’t have missed!! 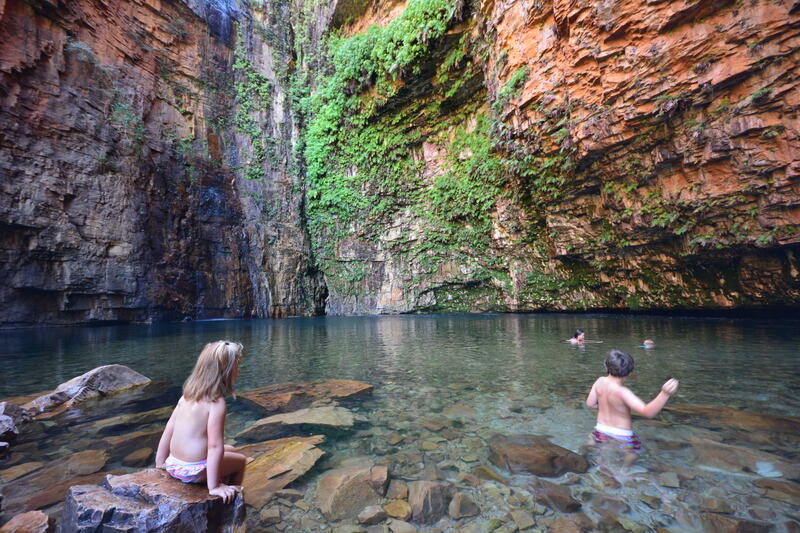 Has anybody else visited Emma Gorge on their travels? Did you like it? Right, back to the trip! 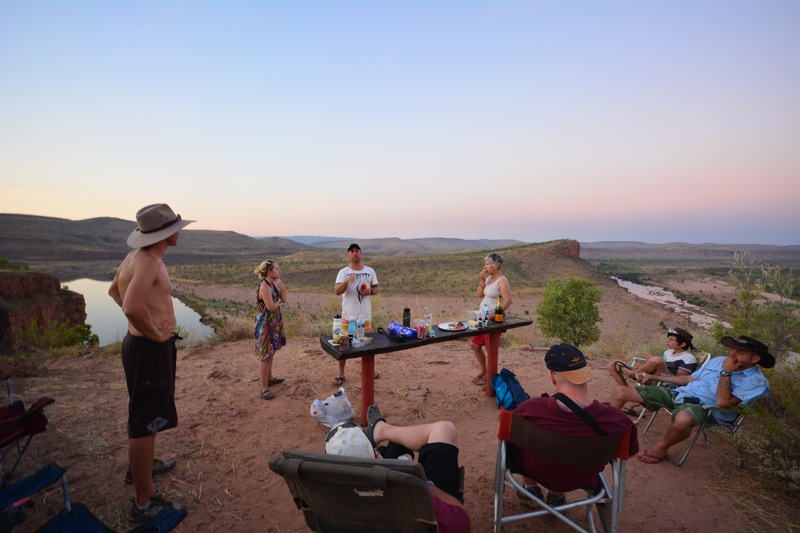 Our last post saw us travelling along the Gibb River Road, where after a long day on the road we eventually arrived at El Questro Station. I had been leaving this post for Matt to write as El Questro Station was his favourite stop on our whole trip, but the Farmer Boy just doesn’t have time at the moment and he is usually asleep in the chair in the lounge by 8pm, so if you want some more ‘blokey’ details about El Questro just yell them out in the comments and Matt will get back to you! 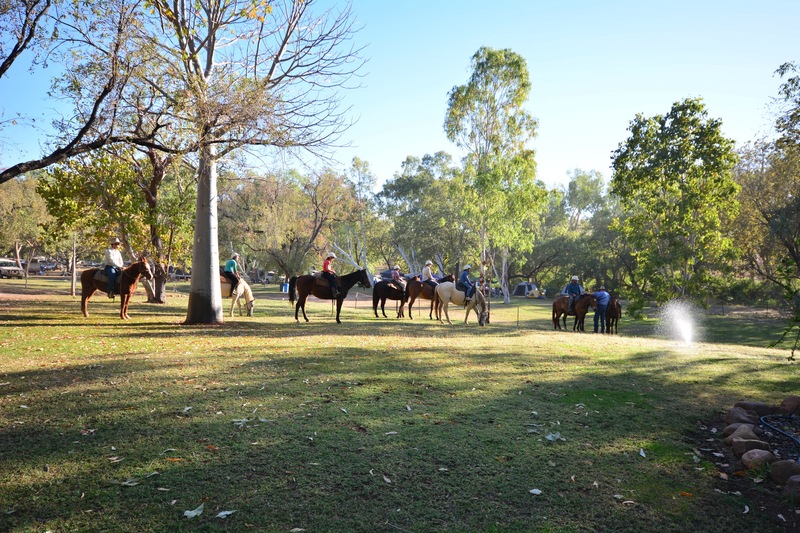 We arrived into El Questro (after a nervous creek crossing in the dark! Very difficult to see how deep it is at night!) after the sun had set so we once again had to chose a site and set up in the dark! Luckily the park wasn’t very busy so there were plenty of nice shady spots in the campground. After a quick set up we treated ourselves to dinner at ‘The Swinging Arm Bar’. The food was yum and the entertainment was great! The kids loved the whip cracking and jokes, and Matt and I thought the guy on the guitar was really good. Toby once again fell asleep at the table and everywhere we went around the station after that other campers would say ‘oh you’re the family who had the little fella asleep at the table’! We were up early the next day to do the free walking tour of the immediate station grounds. It was nice to orientate ourselves and gain a little bit of the history of the station, but our tour guide wasn’t much of a talker so it was a little bit of a waste of time we thought. 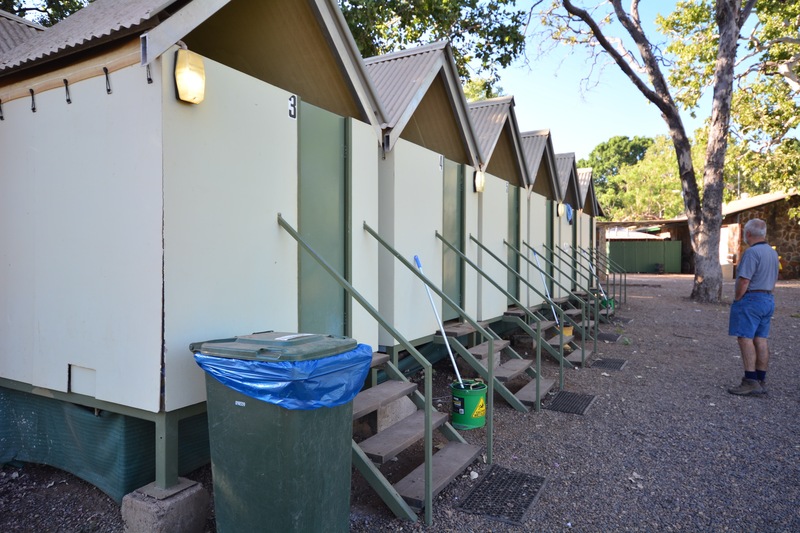 We loved the amenities at El Questro – great little toilet/shower huts that you could have all to yourself! 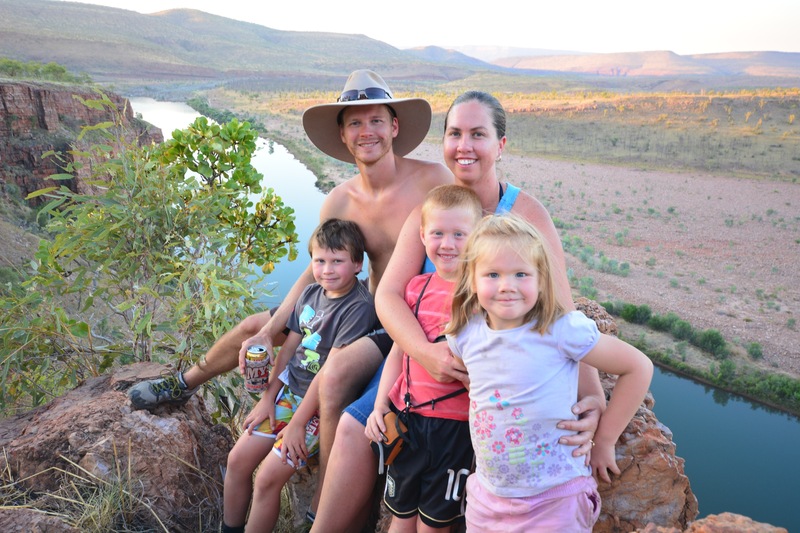 As we only had two nights at El Questro, that meant a jam packed day of sightseeing for us, but boy was it awesome! 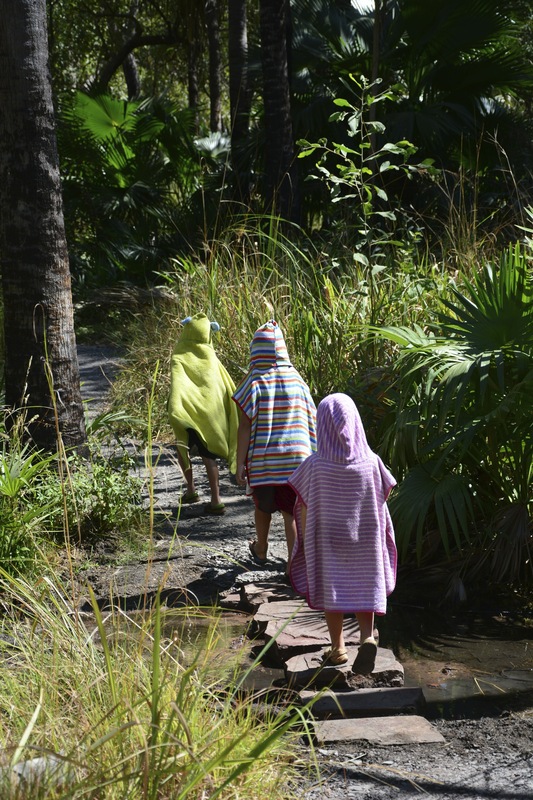 We started the day with a swim at Zebedee Springs. 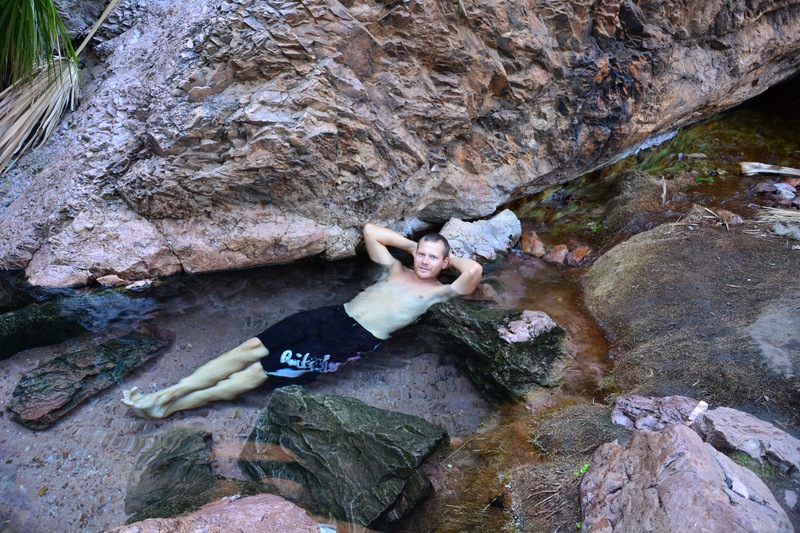 They were the most amazing hot springs ever! 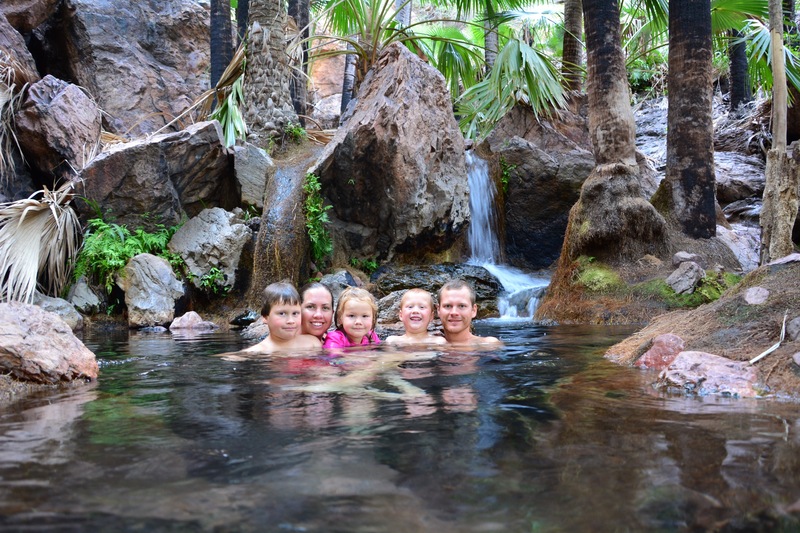 The springs are an easy, short walk from the car park and are set in amongst the rainforest and beautifully warm – we all could have stayed there all day!! 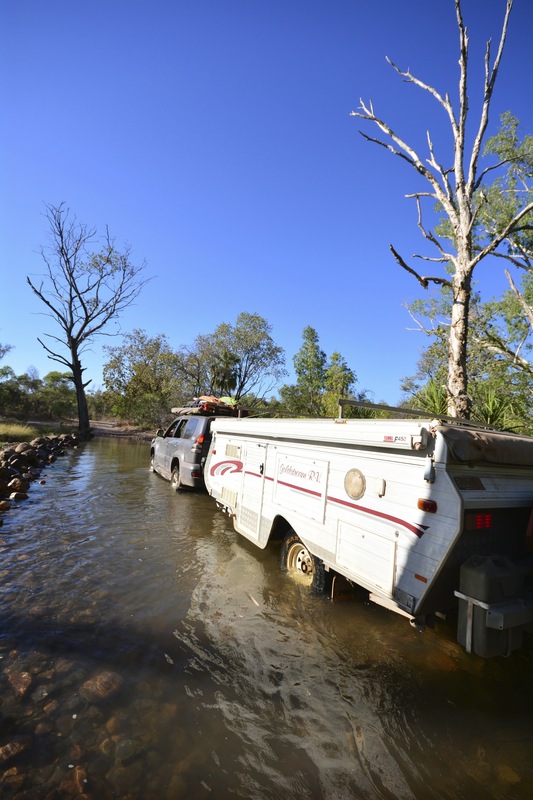 Unfortunately the springs are only open to campers/visitors in the morning and then closed off for the rest of the day as the station is trying to restrict the human impact on the springs and also allows it’s very high fee paying ‘Homestead’ guests exclusive use in the afternoons. Our tip is to get there as early as you can, before all the tour buses arrive! 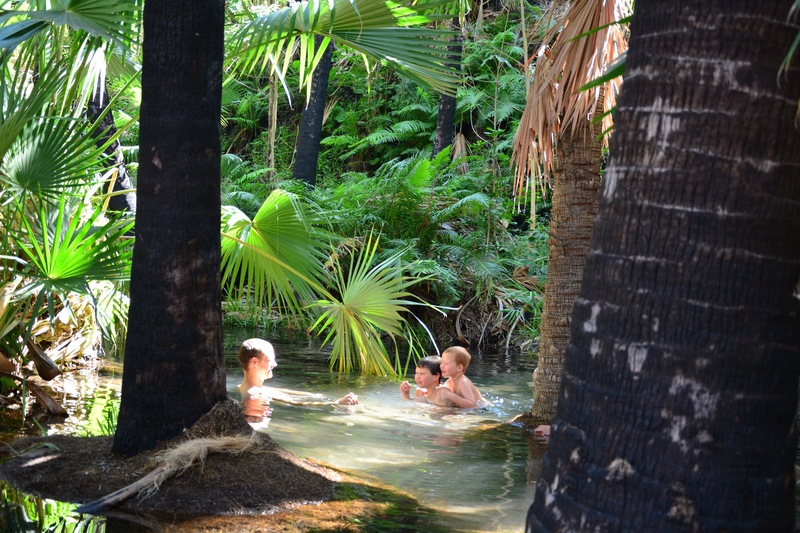 We loved that the springs are still in a very natural state, no concrete paths or walls – it really was beautiful in there – a real oasis!! We all had so much fun paddling around! Can you see how clear the water is! Relaxed much! So beautiful and warm and heaps of little spots to find your own private waterfall! 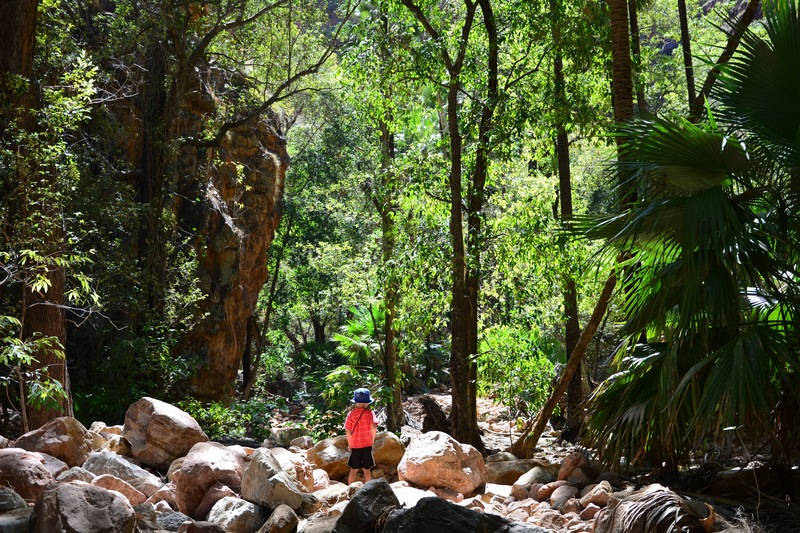 From the springs, we decided to have a go at walking some of the El Questro Gorge trail. 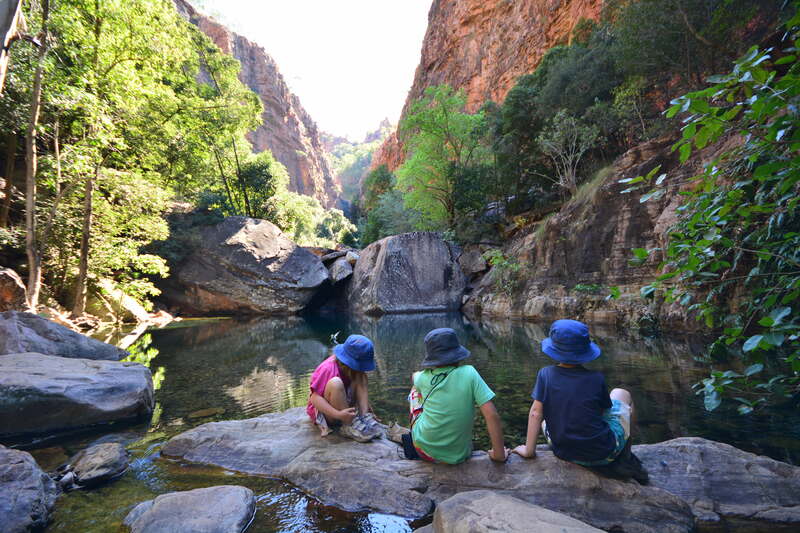 We easily walked in to the halfway pool of the gorge (1.3km’s) in a bit under an hour with the kids, but once we reached this point some other walkers advised that it would be really tough going for the kids to go much further as there was lots of climbing and rock hopping involved. 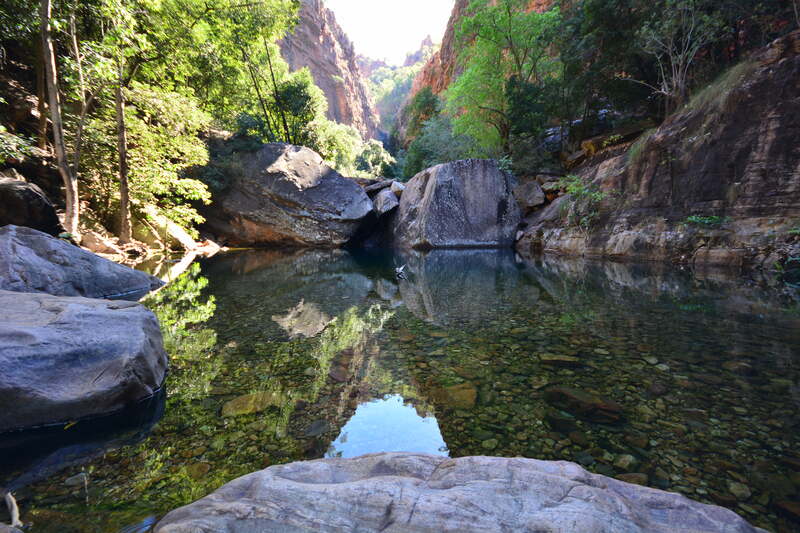 So, we enjoyed a refreshing swim in the small swimming hole and then walked out again. 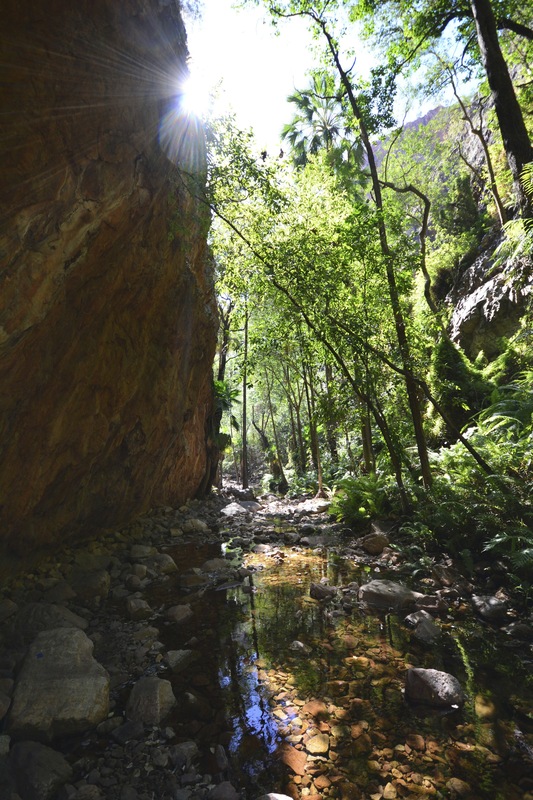 It was a really lovely walk, nice and shady so we were out of the sun for the hottest part of the day, but we definitely want to go back again and trek all the way in to the top pool of the Gorge as the photos of it looked quite beautiful – next time! Really pretty walk – Tobes loved it! 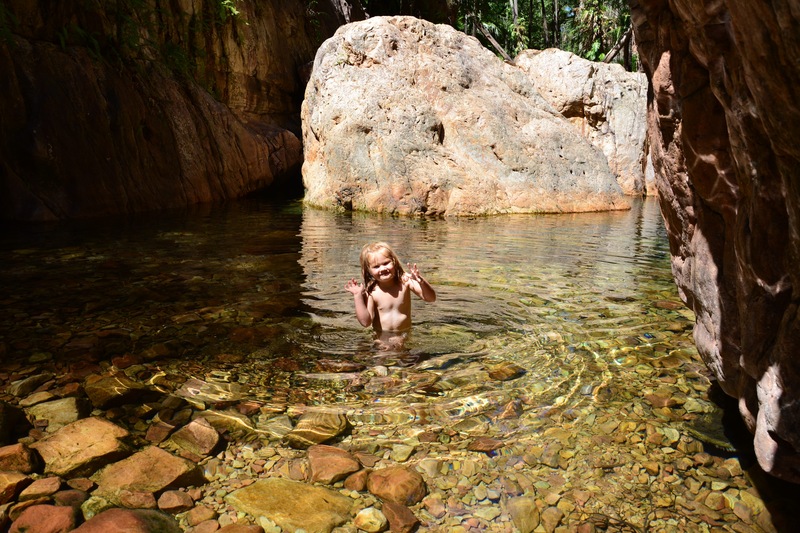 Lex having a swim in the water hole at the half way point – beautiful clear water but pretty cold! 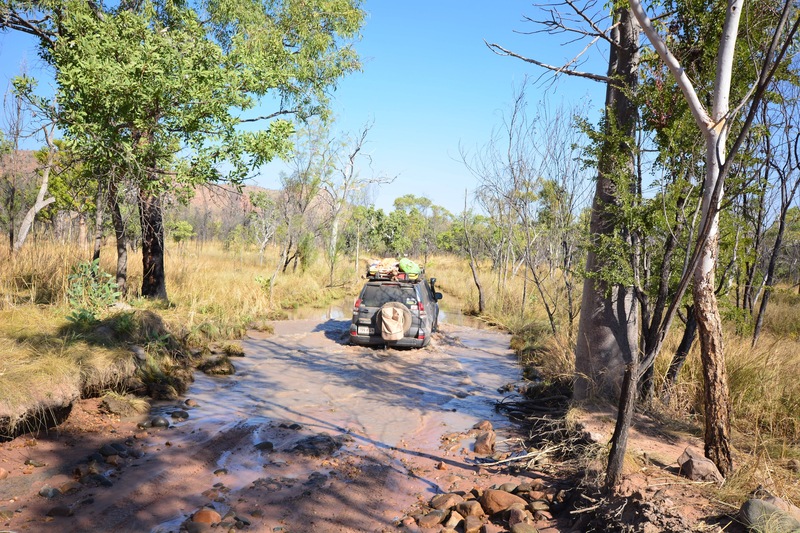 The road in to El Questro Gorge is 4wd only and Matt loved having a bit of fun in the mud and creek crossings in Peter Prado!! We did a little bit of driving around the station and checked out Moonshine Creek and a little picnic area that I have forgotten the name of now! 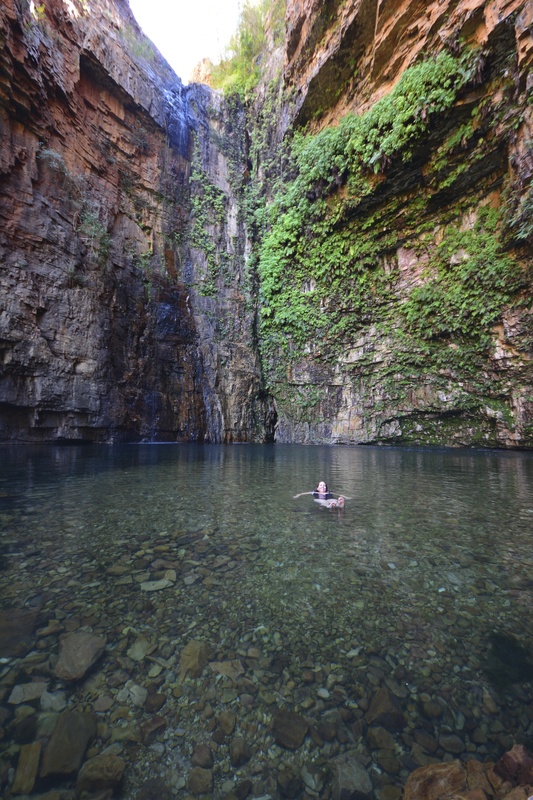 Moonshine Gorge – there was a family painting and swimming here but we didn’t think it looked that inviting! 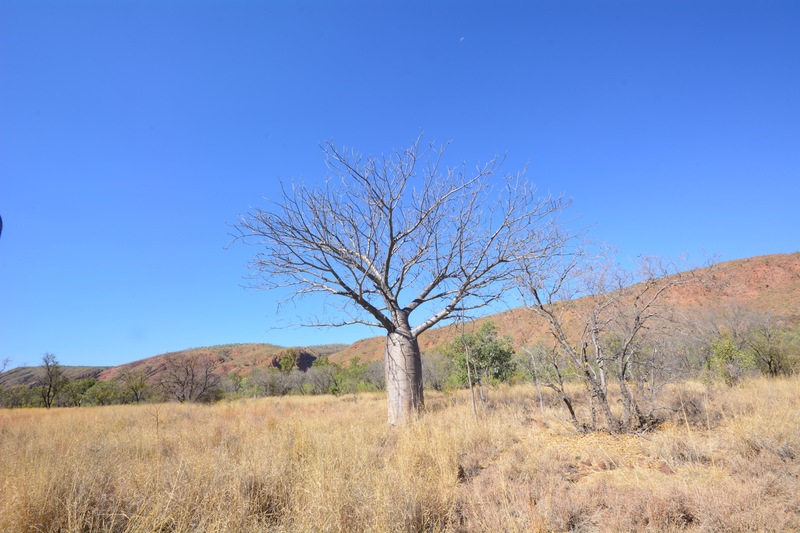 Gotta have another Boab Tree photo in there before we leave Western Australia! We decided for our lunch stop (albeit a very late one!) 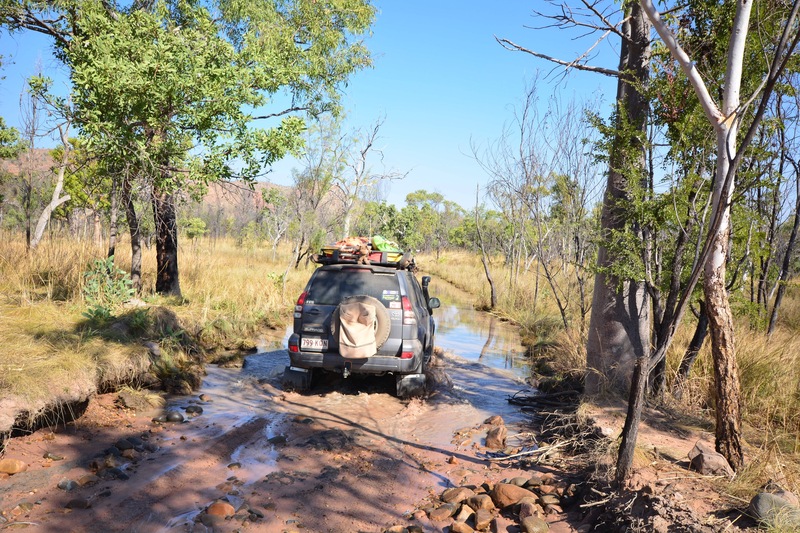 that we would tackle the 4wd track up to Saddleback Ridge. 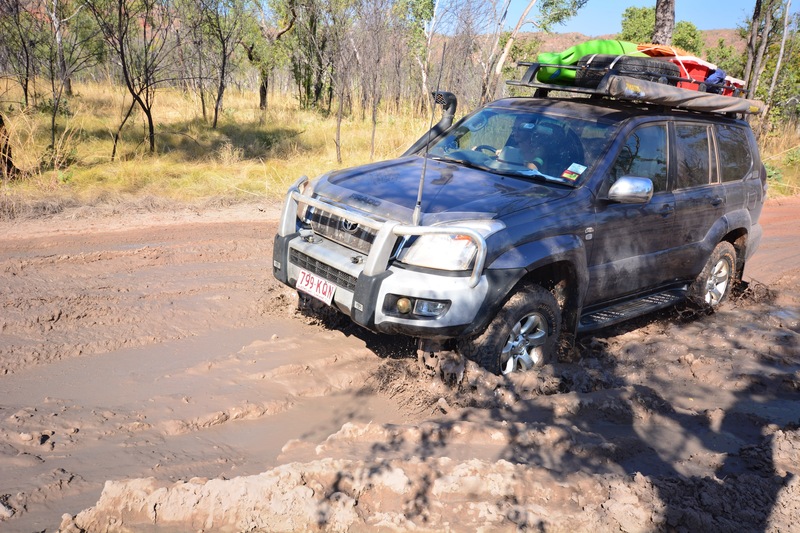 I was a bit nervous about this as the station information pamphlet for this drive said ‘recommended for experienced 4 x 4 drivers only. 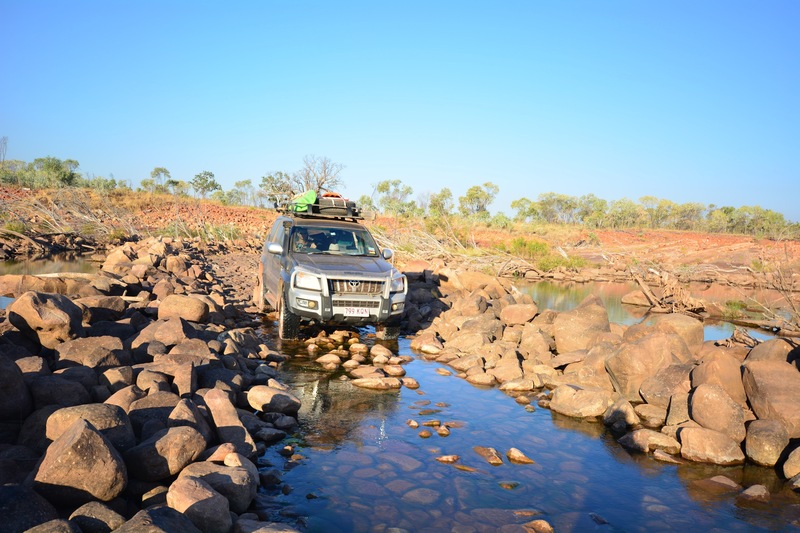 This very steep, narrow and challenging 4WD track really highlights that getting there is an adventure in itself’ – eeeek! But off we went and we were fine! 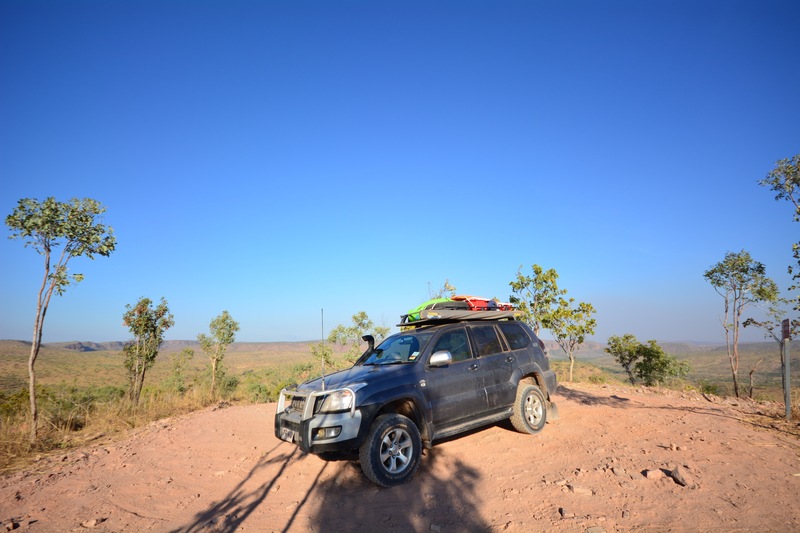 I wouldn’t have liked to have met another car on the track – it was VERY steep and VERY narrow but the view at the top for lunch was amazing! Well done Peter Prado getting us to the top! Great views at the top and the spunky husband ain’t bad either!! We finished off the day with a spectacular sunset picnic at Branco’s lookout. It was a bit of a drive to get to Branco’s lookout, not difficult 4wding though, and we were disappointed that there wasn’t much water in the Pentecost River crossing (it would be spectacular with water in it) but it was a great spot to watch the sun go down over El Questro and such a good way to end what was really an awesome day of adventuring and exploring! 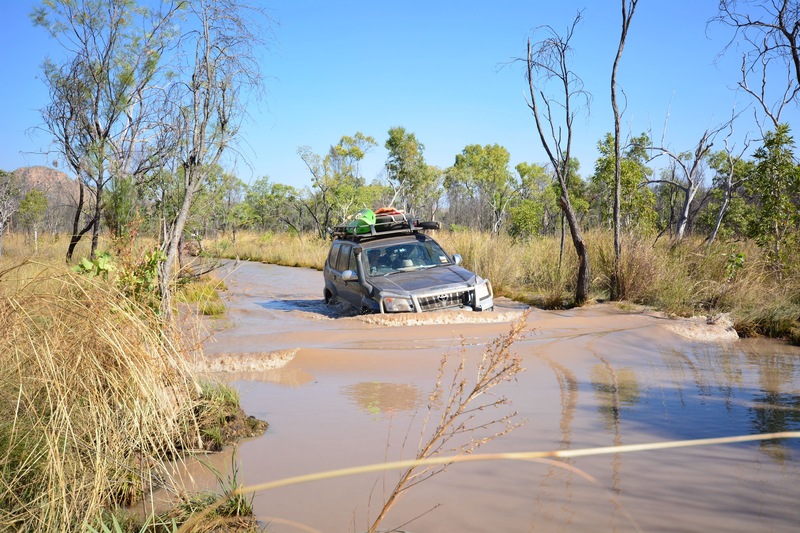 We missed out on doing heaps of other great things at El Questro Station, such as the Chamberlain Gorge cruise, Champagne Springs hike, Explosion Gorge 4wd track, Pigeon Hole 4wd track, Amalia Gorge trail and heaps of other bits and pieces. 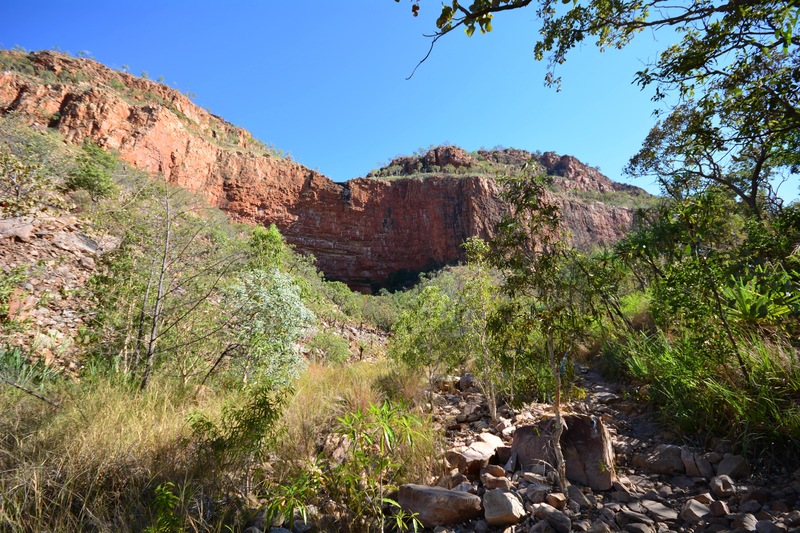 We hadn’t done any research on El Questro Station before we arrived there and had no idea how much there really is to do and see! I think you would need at least a week there – if not more so you can enjoy some relaxing time in a pretty spectacular spot! 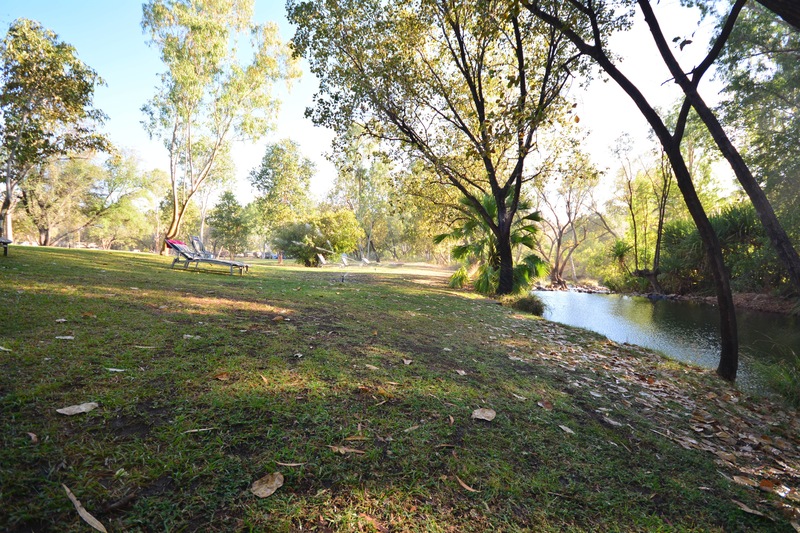 And we would definitely, definitely chose one of the private campsites along the Pentecost River at the station. There are no amenities on these sites but they looked beautiful and it is only a short drive back to the station if you really wanted a hot shower!! 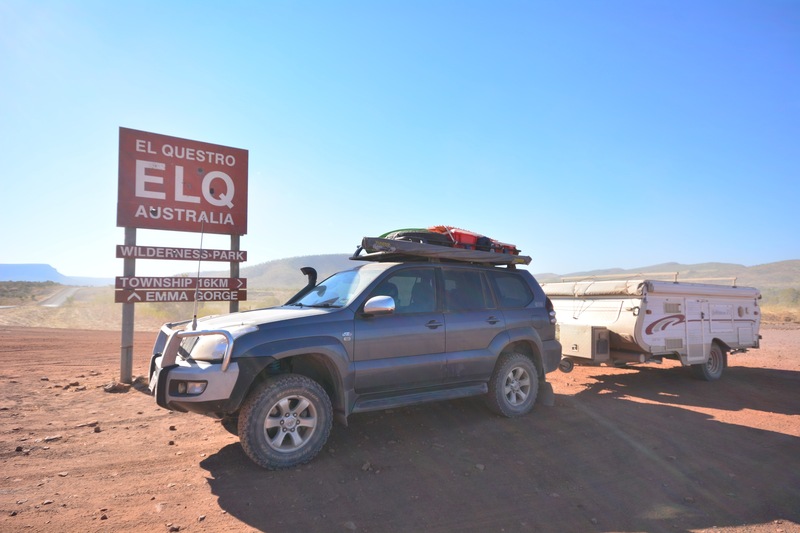 If you are a 4wd enthusiast and camper then be sure to add El Questro Station to your list of places you must visit!! PS. 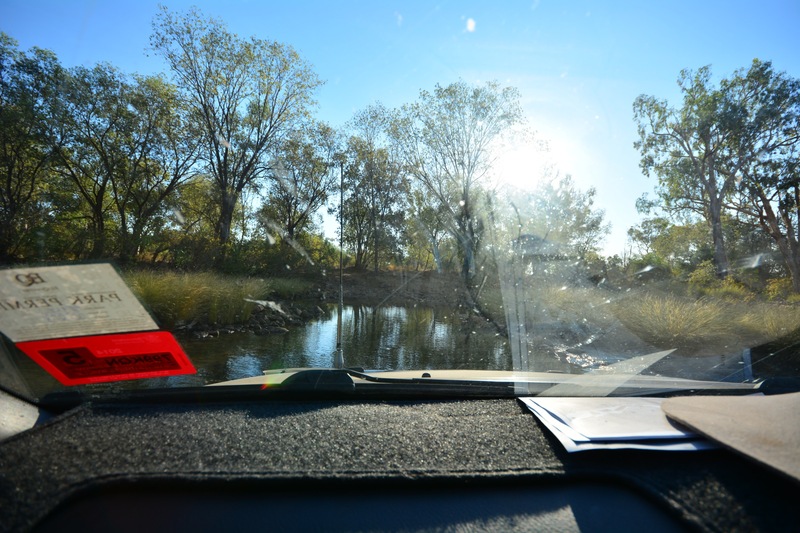 You can get to El Questro Station from Kununurra in about an hour and a half, and the road is all sealed to the Station turn off. From the turn off it is 16km’s of gravel and there is a water crossing to consider, but the road wasn’t too bad at all!